Indeed, but where to wear it? meh, not for $500. she can wait. HAHAHAHAHAHA! That was funny! Wow I am still picking my self up off the ground! Thought this was pretty neat. Haven't seen one of these Fett tournament boxes in years on eBay. Not bad for three of them. Nothing to do with Star Wars...but just wanted to show you guys what im getting to sup up my Indy costume. Great finds Val!! Those will make a NICE Indy outfit!!! I wish I had his hat, that's my favorite! Well....some jerk snuck the jacket out from under me. Auction ended a little while ago. Im so damn mad right now...perfect jacket, resonable price. Damn. Here's an oddity I've never seen before. Cool costumes!!! But yah I at the moment have 0 dollars and 0 cents. It stinks being broke. Found this through MandoMercs, but for all of you looking to make your armor, several affordable parts are being sold by cyanide Full Body Plates, everything but Guants and Bucket For $85, Buy it now paypal only. Chest, Shoulders, COD, knees, back and lower back plates $45, Buy it now paypal only. A recommendation for anyone looking at a custom Mando--either gives you almost everything you need to join the MandoMercs as a full member--just add gloves/gaunts and a helmet, and you're set. I'm looking into a separate set of plates (metal) or else I'd buy these. Found this the other day. 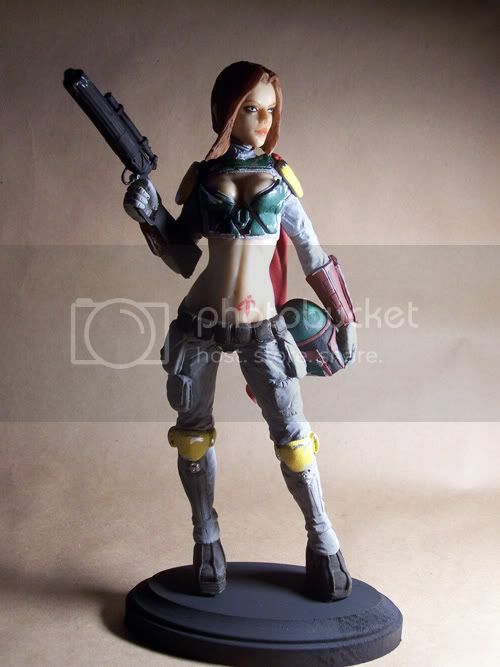 Pretty neat She-Fett statue that this guy is making, from Spectre Studios. He also has some female Master Chief and Hellgirl statues. He's doing one with black hair and brown hair. Nice touch with the tattoo. Looks like he's also doing a helmeted version, as well. I think I personally like the unhelmeted version better. 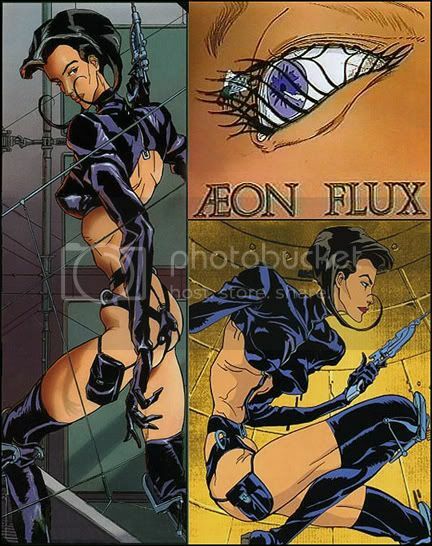 Her face and hair remind me a little of Aeon Flux. Here's his actual website if you're interested in his other products. I never thought I'd see the day that one of these bad boys would show up on eBay. Hmmmm.....it's only going for the price of a new car. Another neat little find. One of the scaled replica blaster variants. I heard there were three types. The normal version, an all matte black version, and this one with the gold plated scope. I cant believe another one popped up...that is like the ultimate Fett statue. Found this the other day. Pretty neat She-Fett statue that this guy is making. He also has some female Master Chief and Hellgirl statues. Here's another neat little find you don't see on eBay that much. The Shadows of the Empire game promo poster with Fett on it. It's from inside one of the gaming magazines. Wow. 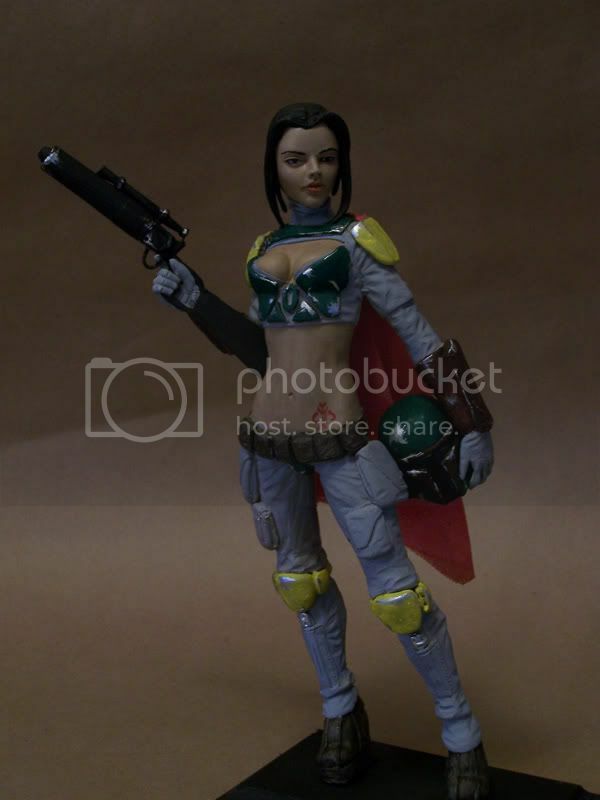 Okay, I just made an Ebay account because of all the awesome Fett stuff! I'm the first bidder on the Shadow of Empire poster, I'm krakenkiller. Nice. The RC helmet looks pretty sweet. the revan costume is almost a jip, it's $400 for the armor parts alone, and $160 for the cloth to the highest bidder.